R.C.M Polytechnic College has provided all infrastructure facilities required to providing sound education. The college can boast of spacious classrooms, fully equipped laboratories, workshops and drawing halls. Library transactions are computerized and it is stacked with the latest edition of books, magazines and journals. 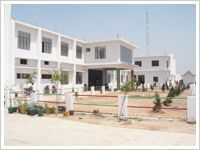 Three computer centers with numbers of systems in network along with internet facilities. A decent education is a passport to a good, comfortable and secured life. It should enable youngsters to become contributing members of society through knowledge, skills and character development.